Located on the grounds of Henry Huntington’s original sweeping Southern California estate, a mid-century dwelling has had its conventional backyard transformed into a classic illustration of water-conscious, sustainable ideals practical in the region’s dry climate and radiant in beauty and design. After forty years of doing their own gardening, the owners decided it was time to reduce their traditional labor as well as their water consumption. Wanting to do more traveling, the couple didn’t want a garden schedule to hold them back! Thus, the original garden needed to shed its traditional skin and metamorphose into a tranquil sanctuary that offered pleasing colors, interesting textures and native distinction. Here in their backyard of among the beautiful mature deodar cedar trees and coast live oaks, the owners wanted an understory garden where they could enjoy doing nothing. In addition to opting for an attractive drought-tolerant backyard garden, the couple also wanted to incorporate man-made components such as the newly renovated pool and Jacuzzi and adding a new fire pit. Contacting Heather Lenkin, the owners explained they wanted an easily maintained garden retreat that would integrate modern comforts. 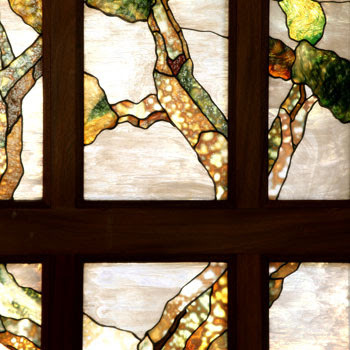 Lenkin was inspired by the muted organic stained glass of the home’s front doors; the design gave Lenkin the impetus to create an organic xeric retreat in the heart of this well-manicured San Marino neighborhood. To begin, Lenkin wanted to unite the scale of the existing enormous cedar and oak trees with the smaller scale of the pool, deck and new fire pit. The solution: 15 tons of local river boulders which provide a natural backdrop to the pool but also point the eye upward, with mass and scale, to the surrounding giant ancient trees. Lenkin employed boulders elsewhere in the garden: a waterfall cascades over the oversized rocks into the pool and nearby Jacuzzi giving the illusion that these water elements are part of a natural landscape. In keeping with environmentally-friendly principles, Lenkin reused plants and materials as much as possible in the garden. Taking design direction from the existing walkways Lenkin created a black pebbled concrete pool deck with an entertaining area adjacent to the fire pit. 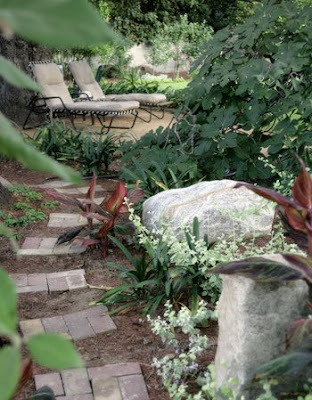 The smooth black pebbles perfectly complement the grays of the nearby granite boulders. Since a xeric landscape doesn’t usually include a traditional lawn, Lenkin eliminated most of the grass area and installed a water efficient drip irrigation system, which is conveniently set on a timer. She crafted decomposed granite pathways so that irrigated water could easily filter back into ground in a water-conscious manner. Pathways lead to the fire pit that is snuggled into massive boulders under the shade of cedar trees, a small patio, and a tennis court. Another water-conscious touch: small water jets were added to the pool wall, creating the cooling sound of water, especially welcome on hot summer days. 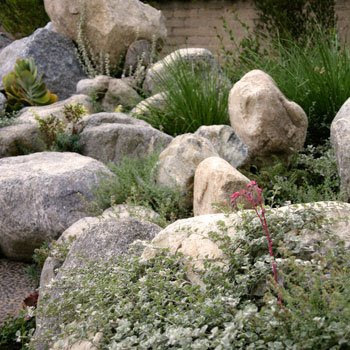 Overall, the plant palette for a “dry scene” (xeriscape) effectively involves slow-grow ing, non-invasive plants that require small amounts of water, little to no fertilization, and low maintenance and pruning needs (thus reducing yard trimmings). Another bonus for choosing these plants: by their nature, they present minimal pest and disease problems and pesticide use is practically nonexistent. Lenkin’s design skillfully integrates attractive plants, including numerous indigenous plants including foxgloves, the delicate and tiny Santa Barbara daisies, and purple sisrynchium bellum. The color combinations focused on muted grey-greens accented with blues and bright yellows and oranges. In addition to using plant materials from California, Lenkin also selected flowers and foliage from other Mediterranean climates, such as Southern Europe, Africa, Western Asia, and Australia. Recurring patterns of plant combinations are found throughout in the garden. California lilacs, for example, are repeatedly woven into pockets with succulent echeverrias and sedums. Groupings of dodonaea, phlomis, canna, kniphophia, agapanthus, achillea, echinops, euphorbia, Helichrysum, aloes, nasturtiums, nepeta, sedums ceonothus, convolvulus and chreiranthus cheiri are rhythmically repeated down the new south facing planter between the pool and the orchard. 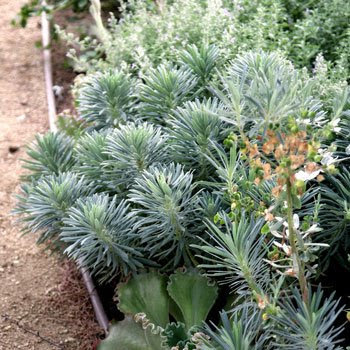 Since the south-facing garden takes a beating in the summer heat, Lenkin specified tough plants. Senecios, wild flowering euphorbias tirucalli and wulfenii present fascinating year-round visual interest. Heat-loving South African helichrysums (petiolare and limelight) offers soft fuzzy foils to the nearby giant boulders. Elsewhere, bunches of variegated old-fashioned irises create small vertical spikes in the garden and contrasts nicely with the round shapes of the succulent kalanchoe thyrsifolia (flapjacks). 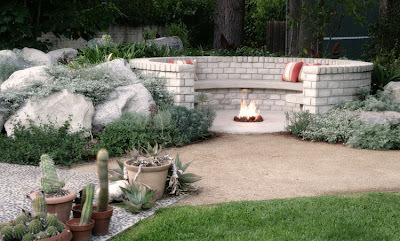 A recycling project involved the owner’s collection of agapanthus and clivias; Lenkin divided the hardy plants and reused them in the fire pit area where they blend in handsomely with catmint (Nepeta) and native California lilacs. A dry garden does not mean emptiness; wildlife now abounds in the garden; hummingbirds and butterflies are attracted to the orange flowering aloes, achilleas, and California native monkey flowers (Diplacus aurianticus) among others. Native bees and beneficial wasps buzz around foxgloves and thyme. Indeed, birds and bees may find their way into the garden from the perfumed air that permeates from the small citrus orchard behind the pool to which Lenkin added delicious Valencia oranges, Bearss limes and blood oranges. Altogether, this once traditional garden has been converted from a labor-intensive place into an ecological healthy and environmentally friendly place that unifies all with splendid colors, appropriate spaces and artistic designs. Now, when the owners faithfully swim their morning laps they are pleased to share their nurturing surroundings with the local wildlife. They know as they lock the house up for a week abroad, their backyard is being tended by the best care that Mother Nature can afford: the birds, the bees and the other local pollinators. And that is enough. I give the place a huge WOW! I feel like I could live there and never leave. Nice. Never imagined that dry plants could make big difference. +1 for you buddy. Nice post. I hope you could also post some tips on how we could upkeep those dry plants during wet season. Thanks in advance!